Yesterday I witnessed a script based malware attack on my computer. This malware, which infected my computer came from my friend's USB drive. He connected that pen drive to my PC and double clicked a folder in it. Unfortunately, that folder was a shortcut created by this malware. Target location of the folder was; C:\windows\system32\cmd.exe /c start WScript d3d3\icec.js & Start Explorer.exe "RECYCLER" and I believe WScript.exe is infected by this malware. This script automatically set the home page to "http:// india4you. info/r.asp#" in Firefox. Also, the default Search too changed to one malicious URL address. Gladly Avast installed on my computer was able to detect it. Avast stopped Firefox from accessing the page. 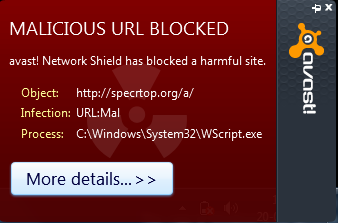 At the same time, Avast web shield started to stop browser's attempts to connect with other malicious websites. While carefully analyzing each attempt, we found that the process is originated from WScript.exe by the malware. Since the first location, we should check after malware infection is Startup, I tried to open System Configuration using the command msconfig. This script created some unwanted Startup services but Wscript.exe prevented me from opening msconfig on my computer. So the steps I took to fix this issue are provided below. Reboot the computer and check whether Wscript.exe is still under processes. 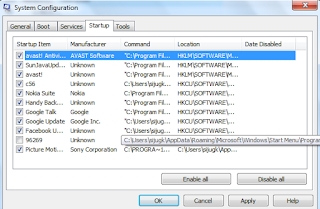 If it is still present, you need to repeat the process and disable all Startup programs except AntiVirus. Most of the script based malicious codes prompt browsers to load other compromised websites for various reasons. If you discover such website, there are some steps you can do against it. To learn more about how to deal with infected websites follow the link below. After the infection, the major problem I faced was slow Internet connection because of the automatic attempts of Firefox to access remote compromised websites. Luckily Avast web shield protected my computer from opening those websites. Since it is a security article, I think it is better to give the link to one of my old article about the DDoS attack. To read more about it click on the link below. It was really helpful. My laptop too affected with the same virus and your article helped me a lot. Thanks.. Thanks for your comment Marty.